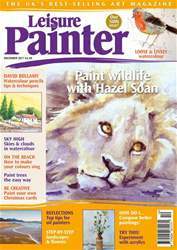 This is the third and final article on the benefits of painting wildlife subjects as a way to learn to use watercolour effectively – and vice versa. An animal may move at any time so the focus has been on how to paint in a swift manner, requiring economy of brushstroke and efficiency of application. This month we look at colour and especially at how the three primary colours – red, yellow and blue – mix together to make a variety of greys, and how two complementary colours can mix to make pleasing blacks and browns. Mixes of just two or three colours are quick to apply, they ensure harmony and make clean, effective watercolour combinations – all of which is especially useful when painting life that is on the move. In all these examples it is clear that a few colours mix to make many more on the paper. Pigment mixing tends to darkness, so the less pigments you use in a mix, the greater the clarity of the colour. Watercolour generally appears more colourful by using a limited palette. Using wildlife as a subject has presented the perfect opportunity to learn more about watercolour. Lots of time is not necessarily a luxury when it comes to painting with watercolour, as it can lead to overworking. Waiting for paint to dry takes time so adding as much description into the first layer of paint makes sense if your subject is likely to move.